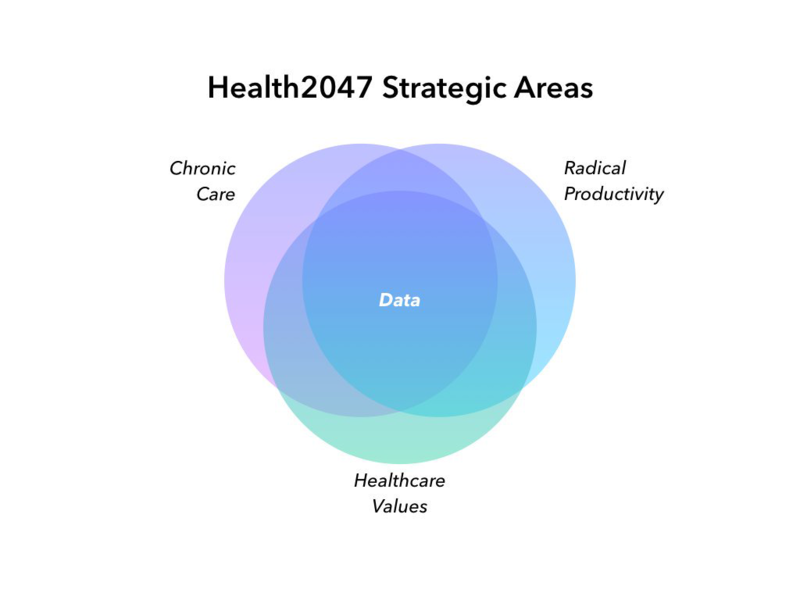 Health2047 emerged from a desire to define what a “healthy” healthcare system would look like by midcentury. Doing so required coming to terms with the deficiencies evident in present conditions. While we’ve grown accustomed to wondrous improvements in diagnostic and treatment capability, the pace of innovation has not translated into progress in population-level health delivery or practice. Our current system is prohibitively expensive and riddled with crippling inefficiencies. Our operational models are antiquated and we lag far behind most other industries in digitalization. Our doctors are fatigued, disillusioned, and shrinking in number. And our overall health as a nation is worsening. To be blunt, the U.S. spends more on healthcare than any other country, but does not achieve better health outcomes. In an age marked by such marvels as gene editing, algorithmic cancer screening, tissue engineering, and a litany of other medical science advancements, the desolate state of affairs in our health system is absurd. To rectify this incongruity and focus our participation for maximum impact, Health2047 sought to identify and address the most pressing obstructions currently blocking progress toward a more promising future. Working from the position that the doctor-patient relationship remains core to successful health practice and that modern technology is not being utilized to scalable effect within our system, we began our efforts by leveraging the venerable American Medical Association’s strategic plan to accelerate change in medical education (ACE), boost professional satisfaction and practice sustainability (PS2), and improve health outcomes (IHO). We then examined factors that best determine the success or failure of such efforts by surveying leading commercial partners in the healthcare ecosystem to identify what could best be operationalized in the interface between healthcare and technology. This process revealed four high-priority areas most ripe for disruption and gave birth to our initial portfolio. Working at the system level, we immediately recognized the interdependencies and interrelatedness of all these areas, and the vital role that data sciences play amongst them. To impact chronic disease care delivery, radically improve physician productivity, and tie dollars to health outcomes and value, you have to provide a mechanism to liberate siloed health data for cross-functional, cross-technology usage — you have to enable data liquidity. That’s why Health2047’s first innovation enterprise to be spun out is SwitchCo, which will commercialize a purpose-built subscriber network for data transport that enables the secure permissions-based sharing of health data among patients, physicians, providers, payers, pharma, and other healthcare enterprises. Formulating this solution for fast and effective data exchange in healthcare enables greater progress in the numerous collaborative projects underway addressing all our strategic pillars. Health2047’s overarching vision is to serve as the nexus between healthcare and technology in order to realize productivity gains in the modern economy and deliver a system that effectively employs and reflects the amazing capabilities of our age. Our deep relationships with the American Medical Association (AMA), technology pioneers, and our healthcare ecosystem partners create a unique force multiplier that will drive large-scale enhancements in healthcare delivery, better health outcomes at the population level, and a healthcare system best equipped for the future.